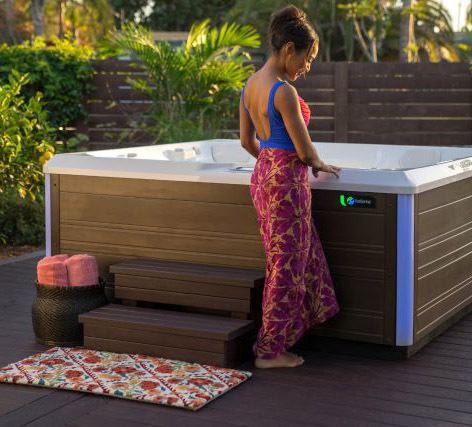 Try kicking off your day with a soak in your hot tub…you’ll love it! January 22, 2019 – A few months ago, Steve Hammock, President of Watkins Wellness (the company that manufactures Hot Spring Spas), came up for a visit. During our time together, it gave us a chance to chat about a lot of different things. At one point, we both chatted about how we chose to start our day. I’ve shared before that, at the present time, I made the choice to downsize and currently live in an apartment while I decide where my next home purchase will be. Because of this, I unfortunately can’t have a hot tub. But I do have my infrared sauna with me, which I faithfully use every day. I tried both using it in the evening before bed and in the morning. I found that taking a sauna in the morning really seems to be the ticket for me. When I shared this with Steve, he proceeded to tell me how he starts his day with a soak in his Hot Spring Spa. For him, the ritual of getting in a soak each morning gives him some quiet time to reflect, have time for his daily devotions, and gets him in the right mindset to conquer the day ahead. Really, this comes down to your body and mind’s response to hot water soaking. There’s nothing like a good soak to help your body’s serotonin and endorphin production. Getting those feel-good chemicals kickstarted at the beginning of your day is certainly a good thing! Add to that the fact that heading out to the tub in the brisk morning air will help you shrug off that last bit of grogginess from your slumber, as well as the benefits of buoyancy and heat ridding your limbs from any stiffness? You’ll naturally set yourself up for a great day. Increasing blood flow to the brain is another benefit. It’s really quite something when you take a soak in the morning. It can help you organize your thoughts, plan your day, and many times can help spur new ideas. It’s not accidental that one of our customers called his hot tub his “think tank”. If you’ve not given hot tubbing a try to start your day, do so! You’ll discover that you’ll be getting things off to a very bright start.